Check the weather around you and all over the world at a glance. 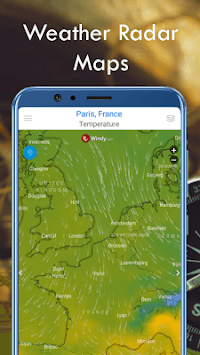 Weather Forecast Live for Android, provides current detailed meteorological observation and weather forecasts for all places of the world, it looks for your address automatically, and provides the current temperature in degrees Celsius and Fahrenheit. It also provides the current state of the weather, relative humidity, atmospheric pressure, visibility distance, precipitation in different United, UV index (UV index), dew point, speed and direction of wind, in addition to ten days of weather forecast and schedule. The app also provides sunrise and sunset depending on the time zone of the city. You can also track moon phase status for the current time and more than 5 days. The app includes many cool, portrait and landscape style widgets. The clock widget displays time, date, and battery information, calendar events, in addition to weather information. 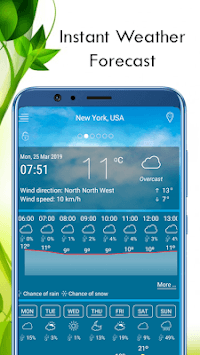 Weather & Clock Widget for Android supports a wide range of Android phones; it supports Android version 2.3 and higher. ✓ Free. It is a free Weather channel, weather network. 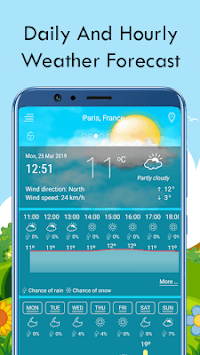 ✓ Live weather forecast for free: this weather and climate app offers daily weather, hourly weather forecasts and monthly weather forecasts. Meanwhile, it also provides interstate travel weather forecasts and forecast weather and wind. ✓ detect your location by network or GPS. ✓ Automatic update intervals are: 15, 30 min, 1, 3, 6, 9, 12 hours and manual update. ✓ Automatic location detection by network and GPS. ✓ Up to 10 different places. ✓ Weather map with possibility to add the whole city to your city list. ✓ Notification Alerts (with possibility to customize sound and vibration or to disable it). ✓ Current weather conditions and five days of weather forecasts. ✓ Support for Android version 2.3 and above. ✓ Searches for all cities in the world by country and city or zip code. ✓ Ability to configure your Wi✓Fi Internet source only. ✓ Ability to disable the Internet access of operators while you are roaming. ✓ Ability to configure your favorite temperature device, Celsius or Fahrenheit. ✓ Forecast to 10 days future and hourly weather. ✓ Temperature display in the status bar. ✓ Weather actions and location information with your friends. ✓ Home screen widgets, 5x3, 5x2, 5x1 for widescreen only and 4x3, 4x2, 4x1 and 2x1 for all screens. ✓ Widgets to display calendar events. ✓ Supports Android Wear with the portable version of the application. ✓ Light and dark themes with different icon sets. ✓ Ability to configure custom background for dark theme. ✓ Localized to most languages ​​of the world. Download the weather forecast Live application, you have a weather channel on your mobile. You have weather information today, make weather information tomorrow on your hand.